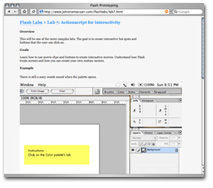 Flash has become an indispensable tool for UI prototyping. I created a series of labs in 2004 to help members of the user interface team at Adobe Systems learn the fundamentals of UI prototyping. These labs provide a digestible way to step through the key issues related to using Flash MX for UI prototypes. They're not particularly useful if you want to use Flash as strictly an animation tool. For example, they don't cover onion skinning. But if you want to learn how to construct interactive projects, it's a good starting point. See the overview page or jump right in to the labs on tracking user behavior, interactivity and custom cursors. Robert Bringhust is an American-born poet, book designer, and typographer. He acquired a B.A. from Indiana University in 1973 and an M.F.A. from the creative writing program at UBC in 1975, where he later taught. One of the most complete books on type and page layout, this books is a must for anyone interested in graphic design. Using a histrical perspective, Bringhurst describes in a very detailed way how one should go about designing the typographic layout of a project. He also provides background on type history, designers and distributers. BJ Fogg directs research and design at the Stanford Persuasive Technology Lab at Stanford's Center for the Study of Language and Information and affiliated with Media-X. I was involved with this lab while I was in school, and it looks at interactive technologies designed to change people's attitudes and behaviors. BJ leads projects on online credibility, mobile persuasion, and operant conditioning via computing systems. The premise is that objects evoke a response. Serious design, by definition, evokes a strong response. This book is about designing for experiences beyond the aesthetic and experiential. It is about design that is focused on changing an individual: to improve a life... or to improve profits. I recommend this book to designers and non-designers alike. One of my fundamental beliefs is that inspiration and methods can be derived from user-oriented disciplines outside of computing as well. The first book I read that seriously looked at this issue was Terry WinogradÕs Bringing Design to Software published in 1996. Winograd, professor of Computer Science at Stanford University, advocates the need for software to be designed, not just engineered. Articles are from some of the most influential minds in the field: Don Norman (Norman Neilson Group), Mitch Kapor (designer of Lotus 1-2-3), David Kelley (President of IDEO), and others. I also need to add John Maeda's old book to this page.